The Thymes Lavender Bath & Body Gift Set will help you take on your day with boundless calm & relaxation. 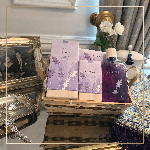 This gift set feature the four most popular Thymes Lavender bath & body products packaged in a hand woven basket. The Thymes Lavender Bath & Body Gift Set includes the following. Thymes Lavender Cologne is both peaceful and pure. With notes of lavender, rosewood, celery sage and violet leaf it instantly calm your senses with a spritz of fresh, herbal fragrance. Thymes Lavender Bath & Body: Helps You Take On Your Day With Boundless Calm And Relaxation.